Hilton Grand Vacations Inc has reported encouraging fourth-quarter and full-year 2017 results, including net income of $183 million and $327 million for the respective periods. 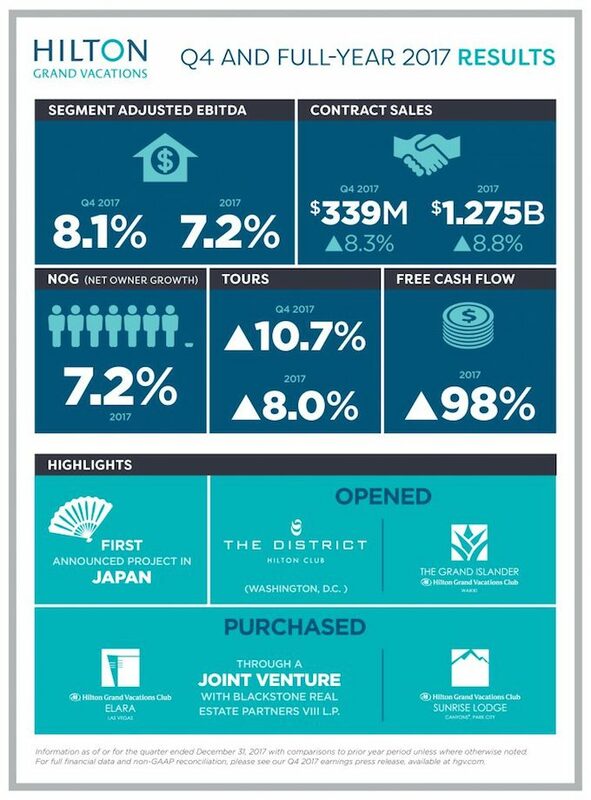 Mark Wang, president and CEO of Hilton Grand Vacations, said: “2017 was a milestone year for Hilton Grand Vacations. We celebrated our 25th anniversary, our first year as an independent company and our 25th consecutive year of Net Owner Growth. Diluted EPS was $1.83 for the fourth quarter and $3.28 for the full year. Net income was $183 million for the fourth quarter and $327 million for the full year. Adjusted EBITDA was $101 million for the fourth quarter and $395 million for the full year. Contract sales increased 8.3 per cent for the fourth quarter and 8.8 per cent for the full year. Net Owner Growth (NOG) for the full year was 7.2 per cent. During the fourth quarter, the Company announced its first dedicated timeshare resort in Japan, a new 132-unit purpose-built development on Sesokojima Island, Okinawa. For the three months ended 31 December 2017, diluted EPS was $1.83 compared to $0.38 for the three months ended 31 December 2016. Net income was $183 million for the same period, compared to $38 million for the three months ended 31 December 2016, and adjusted EBITDA was $101 million compared to $98 million for the same period the previous year. For the 12 months ended 31 December 2017, diluted EPS was $3.28 compared to $1.70 for the 12 months ended 31 December 2016. Net income was $327 million compared to $168 million for the 12 months ended 31 December 2016, and adjusted EBITDA was $395 million compared to $390 million for the previous 12 months. Net income and EPS results for the three and 12 months ended 31 December 2017 include a deferred tax benefit of approximately $132 million, which is mostly attributable to a re-measurement of net deferred taxes related to installment sales using the new 21 per cent federal tax rate provided by the recently enacted Tax Cuts and Jobs Act of 2017.